I’m delighted to announce that The Greenbelt has won a silver medal at an important American publishing competition. Our Benjamin Franklin Award was handed out last weekend at the annual Independent Book Publishers Association conference in Austin, Texas. Congratulations to author Burkhard Mausberg, the former CEO of Friends of the Greenbelt Foundation, which has been working very effectively to protect vital farmland and natural systems at risk of being paved over for suburban sprawl. Kudos to the amazing design and production team who turned Burkhard’s thoughtful manuscript into a splendid coffee table book about Ontario’s huge Greenbelt, which is an incredible place to walk and enjoy nature not far from the Toronto metropolis. Tracy Bordian took charge of the production and design of this beautiful book. Tracy, of Toronto-based At Large Editorial Services, works on all kinds of books for major traditional publishers when she’s not steering our books though the production process. As production manager, Tracy has successfully produced hundreds of books to exceptional standards and has overseen the professional publication of thousands more. From editing to design and layout, page proofing to file prep, digital to print production, Tracy cares about the details, the process, and the relationships critical to the production of quality books. Designer Kyle Gell did a beautiful job of turning the manuscript and a huge number of photographs into a compelling and fascinating book that was a visual delight, befitting the Greenbelt itself. He used all kinds of sophisticated design techniques to make the pictures look their best on ecologically sensitive paper — a must-have for a book about the environment. 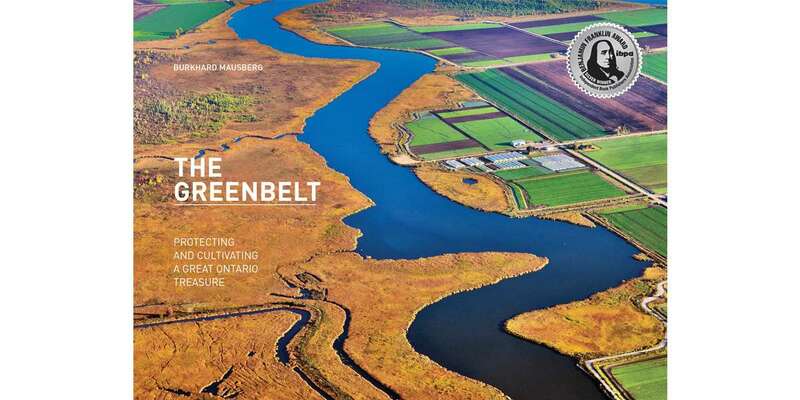 Marquis, our amazing Quebec-based printer, produced the paper for The Greenbelt. It’s called Marquis Opaque, which contains 30% post-consumer fibre, FSC certified. It uses renewable biogas energy and has earned the UL ECOLOGO Certification 2771. This was a true team effort, and I’m so proud that The Greenbelt been recognized at an important international competition. The Greenbelt: Protecting and Cultivating a Great Ontario Treasure is on sale at amazon.ca, indigo.ca and at fine stores near you. It was published by Barlow Books in April 2017.